Jon Harp began life with a deep curiosity of the outdoors and all things where some sort of theory could be developed. His Native American Indian roots seemed to connect him to wild things in a very spiritual way. Especially the ones that swam! In 1991, he happened to see a book in the bookcase named “A River Runs Through it” and by 4:00 am that night his life, unbeknown to him had changed forever. 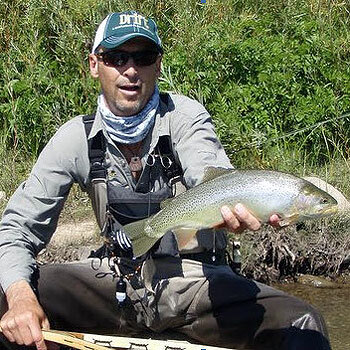 Jon Harp has guided fly fishers for over 17 years on the Conejos River in southern Colorado. Discover one of the last pristine, undeveloped river systems in the West and learn about the big wild brown and rainbow trout you can hook into. The next day the college fund was depleted of its last few dollars and a cheap fly rod and some Chinese flies were purchased. From that day on every other passion he had seemed to diminish while he spent his time traveling the world fishing, reading and spending time with mentors who helped accelerate the learning. Since that time Jon has filmed an ESPN special, been featured in numerous publications, caught a Brown trout world record, filmed a full length fly fishing film, guided in New Zealand, Chile, Colorado and New Mexico and purchased a fly fishing shop, guide service, and cabins called Conejos River Anglers. Currently, he lives and guides on the banks of the Conejos River in Southern Colorado. He lives with his wife Kari and their two children Elijah and River, two labs and a cat. He spends his spare time chasing big fish, trying to become a 0 handicap golfer again, cycling, rafting, and teaching his kids to fish and golf. Jon loves to share his passion with others and prefers to not be in the “shop” much but out in the S. San Juan Mountains that he has spent the last 20 years getting to know like few have. He is constantly fishing, exploring, and developing “out of the box” techniques and sharing those with clients. If he is not putting a new theory under fire you will likely find Jon exploring a remote hike in section of some remote canyon he has not yet found the best game trail to get in and out of yet!